Want to cut the hassle out of transporting your exhibition stand? Take a look at how we run our exhibition services below! With event logistics the key is in the timing, that’s why JamVans offer bespoke services for your exhibition delivery to suit your needs. Take a look at what we offer and get in touch now. 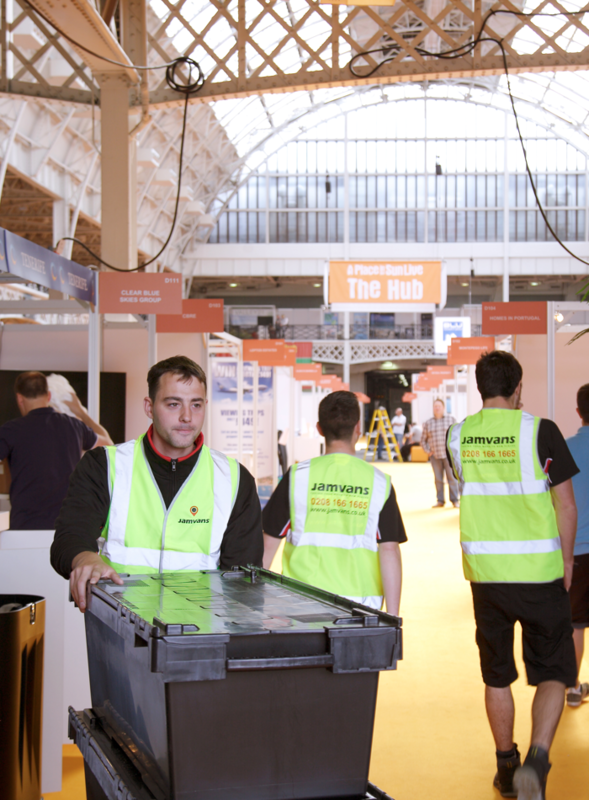 If you have flexibility with your timings we can consolidate your exhibition delivery with other exhibitors. If another exhibitor is going to the same show we are able to put multiple exhibition stands on one vehicle, this a cost effective option. We offer nationwide collection of your exhibition stand and stock with delivery to any exhibition centre within the UK or Europe. We don’t just offer exhibition transport, as we know it’s not always as simple as collecting and delivering, that’s why we provide exhibition storage too, we can collect at a time convenient to you and store for as long as necessary. Once your goods have been delivered, we can store anything you don’t want on your stand, such as packaging, stock and equipment. When at an exhibition you want to show your company at its best. To make your stand looks pristine, being removal people at heart, we blanket and shrink wrap all furniture for transport. With scheduled delivery slots it’s vital that we get in and out as efficiently as possible. We have skates, barrows and pump truck to ensure the seamless delivery of your exhibition stand. Take a look below to see what our clients have to say about working with us! Archivist Press sell letter pressed cards and luxury match boxes and we have been working with William for over two years providing them with exhibition logistics. They initially came to us after they saw us at a trade show in Harrogate. We discussed the size of their exhibition stands depending on which exhibition, this enabled us to quote for their forthcoming events in advance, which helped them with their budgeting. Once we have a full list of the exhibitions that Archivist Press are doing that year we are able to assess whether their exhibitions co-inside with any other that we have quoted for. With the Harrogate Home and Gift Exhibition we are able to offer Archivist Press our flexi rate option and team them up with another company that frequently attends the same show. William has a main point of contact with our team that assists with every exhibition we transport for them. This way we have built up a rapport and our team know exactly where to collect and how to position the stand. Archivist Press transports multiple large book cases to display their stock. The bookcases are matt white and can be easily marked; therefore each bookcase is wrapped in blankets and then shrink wrapped. The remainder of the delivery consist of stock which is transported in crates and boxes. 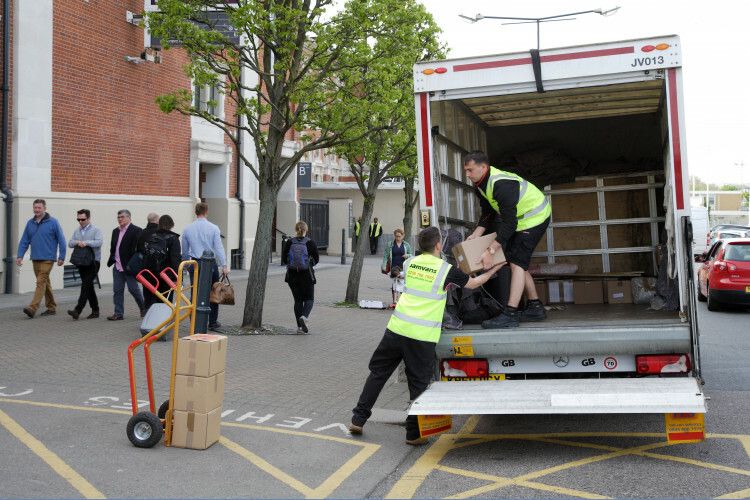 When carrying out a dedicated exhibition delivery we collect the stand at William’s requested time and transport it straight to the exhibition centre. Often nobody is present upon delivery and everything is left at the stand upon the request of William. We then take the shrink wrap and any packaging away with us. Upon collection of the stand we blanket and shrink wrap everything, with a local collection we are able to deliver the same day. However, when the exhibition is further afield we take the stand back to our depot and deliver on another date to suit Archivist Press. “Every year our attendance at three carefully selected Trade Shows is a critical part of Archivist Press’ trading performance and in partnering with JamVans for all our exhibition transport needs we can be certain of a totally stress free build up and break down at every show. Trade Shows are often frantic and having a totally reliable transport partner has been invaluable to us as a small hands on business. We offer a great working environment, with amazing opportunities. Since 2010 we have been delivering our expert services to North and West London. We have grown year-on-year and are dedicated to improving our service for our customers. 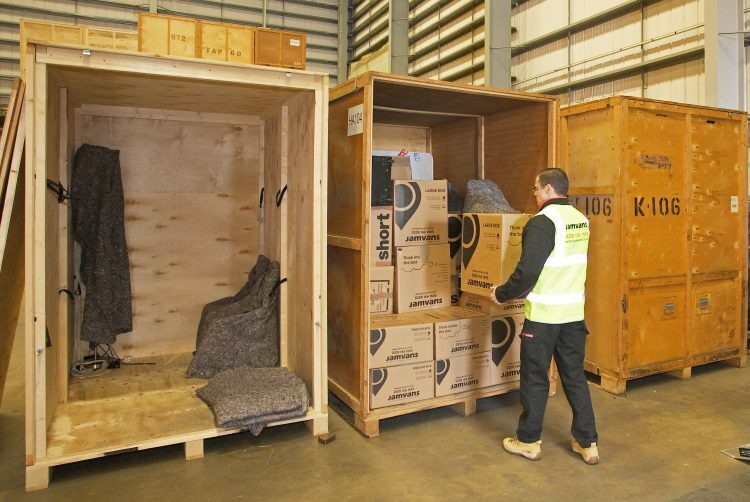 Our temporary storage service is safe and secure so you can focus on moving while we look after your possessions. JamVans is a business name of Jam UK Trading Limited, Registered in England and Wales no. 08200212. Registered/Trading office: Unit 25 Boxted Farm, Berkhamsted Road, Hemel Hempstead, Hertfordshire, HP1 2SG. Vat registration no. GB 144 3711 31.